A long time ago, I posted that we were training for a 5k (3.1 miles) race in Grand Rapids. Well, I just realized that I never posted the results! 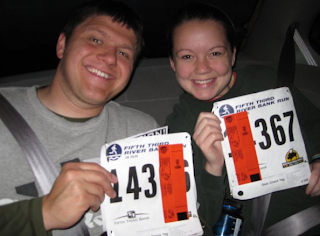 =) We did actually run the 5/3 River Bank Run on May 9. Jake's brother, Jon and (his then fiance, now wife) Summer ran with us. We trained long and hard for it and had a great race. We both surprised ourselves with our finish times and we were very eager to run another race. Erin ran the race in 32:46 and Jake (with a bum knee) finished in 36:37.